The balance of trade, commercial balance, or net exports (sometimes symbolized as NX), is the difference between the monetary value of a nation's exports and imports over a certain period. Sometimes a distinction is made between a balance of trade for goods versus one for services. The balance of trade measures a flow of exports and imports over a given period of time. The notion of the balance of trade does not mean that exports and imports are "in balance" with each other. ^ a b "Trump warns of trade deficits. Economists say, who cares?". Public Radio International. Retrieved 2017-10-17. ^ a b "www.igmchicago.org/surveys/trade-balances". www.igmchicago.org. Retrieved 2017-10-27. 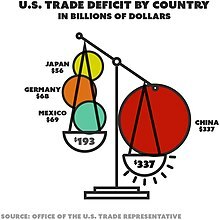 ^ a b "What Is the Trade Deficit?". The New York Times. 2018-06-09. ISSN 0362-4331. Retrieved 2018-06-10. The vast majority of economists view it differently. In this mainstream view, trade deficits are not inherently good or bad. They can be either, depending on circumstances.